Awakening from its long, dreamless slumber, downtown Orlando is finally blinking in the creative dawn of a new era. 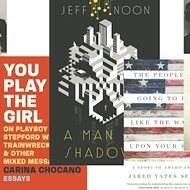 Notably lacking until now in public art, the city's urban core finally joins others of its size and sizzle by adding eight public art pieces to the 26 others which enliven its sidewalks and plazas. 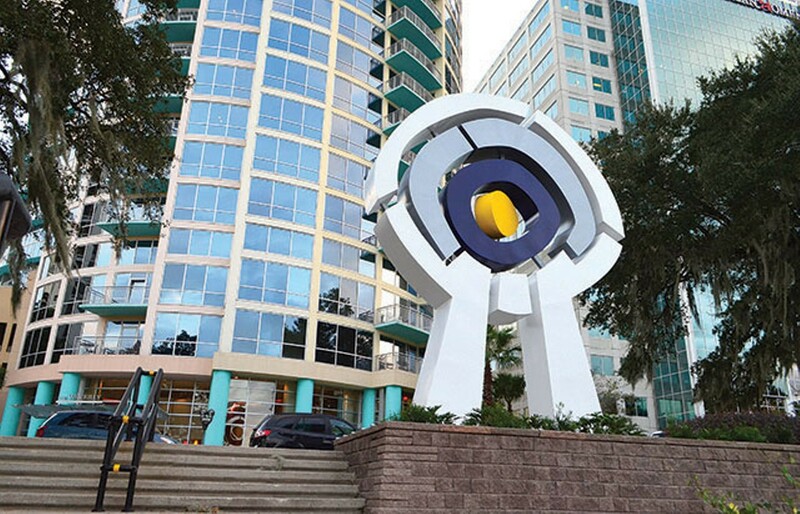 Residents of some cities are proud to see their taxes used to brand and uplift their hometowns; See Art boasts, however, "Each installation will be underwritten by corporate sponsors and maintained by the City of Orlando without utilizing taxpayer dollars." 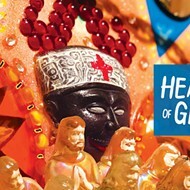 Private sponsors of the See Art initiative include Darden, Bright House, Universal Resorts and Wayne Densch Charities. 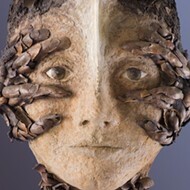 Some individual patrons underwrote the work as well: the DeVos Family Foundation, Harvey and Carol Massey and Family, Khaled Akkawi, and Ford Kiene and Jennifer Quigley each have names on sculptures. Spending on art in a big way is starting to happen once again, and no doubt Orlandoans will feel the same sense of ownership, regardless of who's footing the bill. "Good cities have elements of both surprise and delight, and we hope See Art gives downtown a bit of both," says See Art chairwoman Jennifer Quigley. Donna Dowless, who is an artist herself and also serves on the See Art board of directors, emphasizes that "this is a way to celebrate our city. A sidewalk worth having a conversation about is a sidewalk that brings people back." 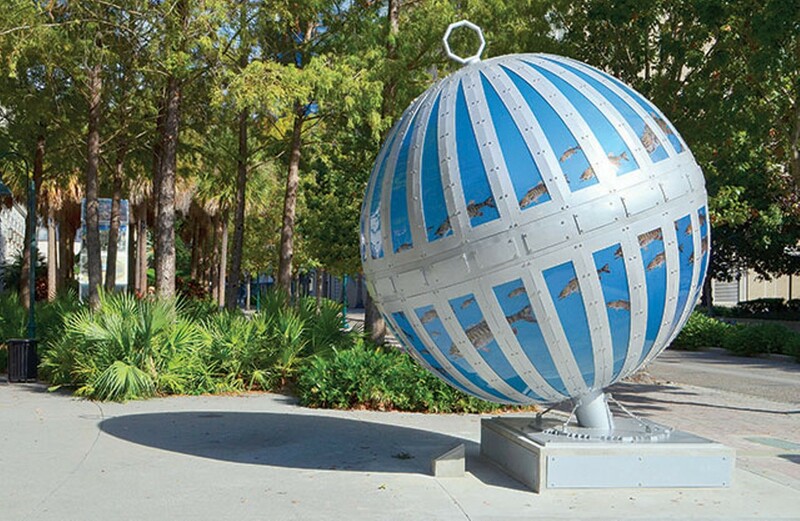 These eight new monumental artworks are strung around Lake Eola, creating an instant art walk for locals and visitors. 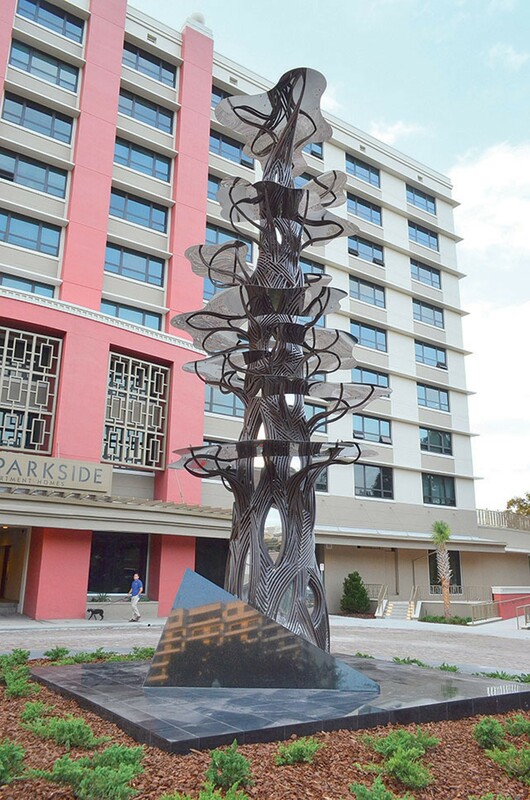 Our own Jacob Harmeling (Qui Studio) provided one piece, "Cedar of Lebanon," putting local artists on par with the national and international artists who made it through See Art's vetting process. In addition to these eight pieces of art, the Tower of Light at City Hall Plaza has been lovingly restored – and the feast of massive public visual art doesn't stop there. 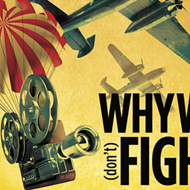 Syd Levy, owner of United Trophy downtown, sponsored a terrific monument to the bravery of the Tuskegee Airmen, a corps of African-American fighter pilots during World War II, now sited at the Orlando Science Center. And possibly most interesting of all is the Urban Art Museum, an experimental project that unveiled its first piece Nov. 19 at 932 N. Mills Ave. Here's a quick rundown of all this art newly gracing the City Beautiful. Star birth is an appropriate theme for Central Florida, what with our history and involvement in space research. 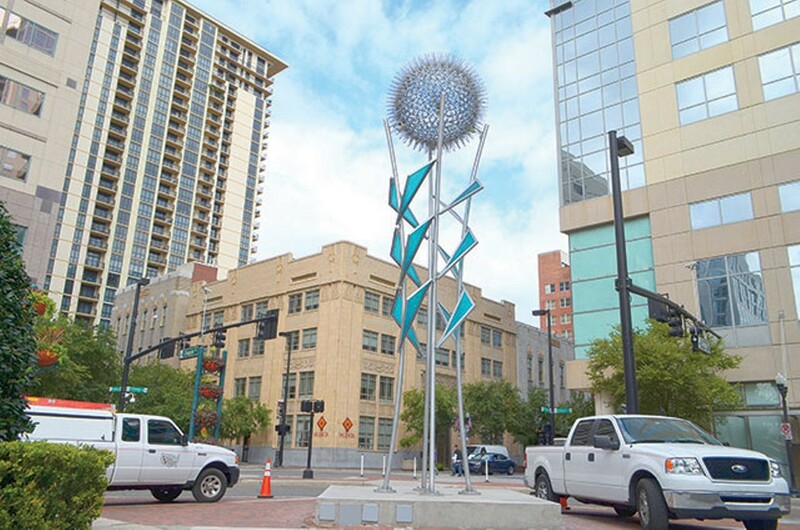 "When I was installing it, people asked if it was a flower," Ross says in a phone interview. It glows with light at night, so it could be our next space flower? 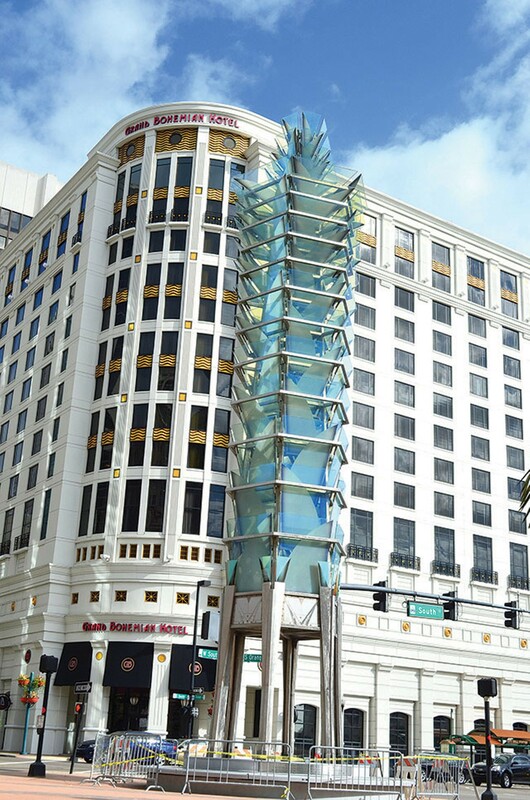 With public art placed nationwide, Ross knows a thing or two about how to enliven a plaza, and Seaside Bank Plaza is all the better for it. Local artist Harmeling created this terrific tree in his Alden Road studio, Qui. The mirror-finish steel "canopy" reflects other trees, neatly stealing vegetative reflections and making them its own. Its sinewy, muscular trunk is earthy, and likely to gather some interesting energy from the surrounding neighborhood over time. Watch for the eyeballs peering out of the trunk. 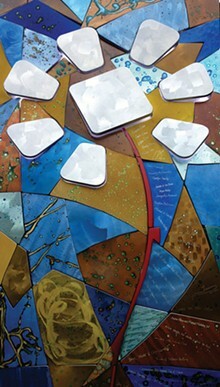 It's more than just centered, it is aimed bull's-eye at the great Eola fountain. Rench's heroic white form has an iconic feel – like we're seeing an instant sacred gate or something. The eye of God, or target practice for bored Waverly residents across the street? What, another space ball? Nope, this metal sphere spins, with prisoner bass seemingly swimming inside. The gorgeous blue windows have a cosmic quality about them, and this globe makes you want to pick up trash or do something to make the earth as clean as Morrison's sculpture. Kurtzman is known for his bronze female nudes with exaggerated, muscular thighs. 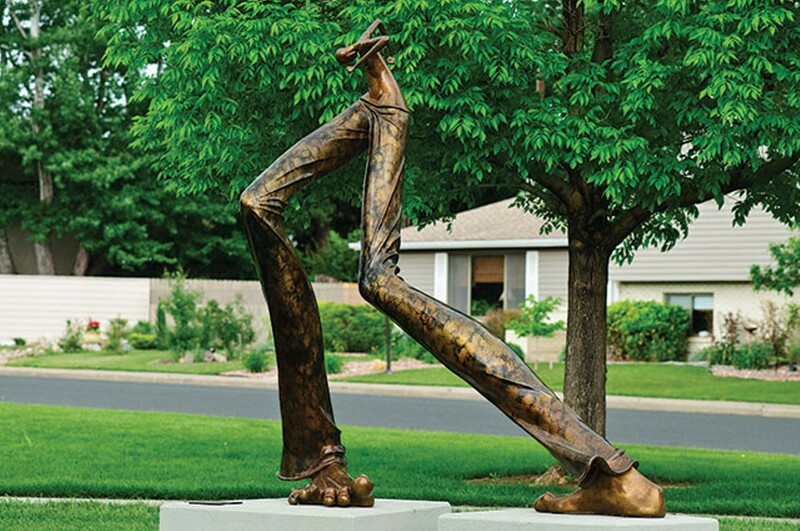 This being the Bible Belt, our Orlando chick's wearin' pants, striding on gigantic feet toward the downtown farmers market with a pocketful of brass. She'll buy out the market, for sure. 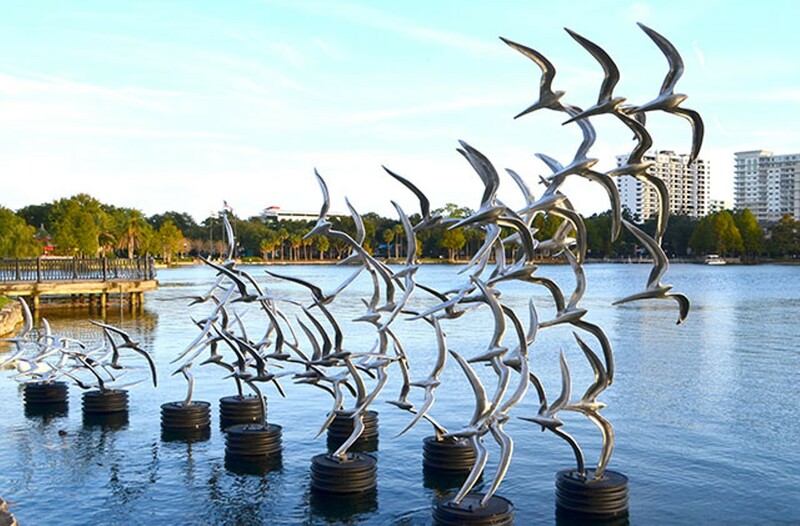 Beautiful polished aluminum birds, winging along Lake Eola's edge, make the heart leap. "It was a tough site, there on the edge of that little lake," comments Blumberg in a phone interview, "and it makes the sculpture even more kinetic." Expect a few surprised dogs to get sore heads when they try to chase them. This giant girl is just waking up, covered in a blanket of ivy. 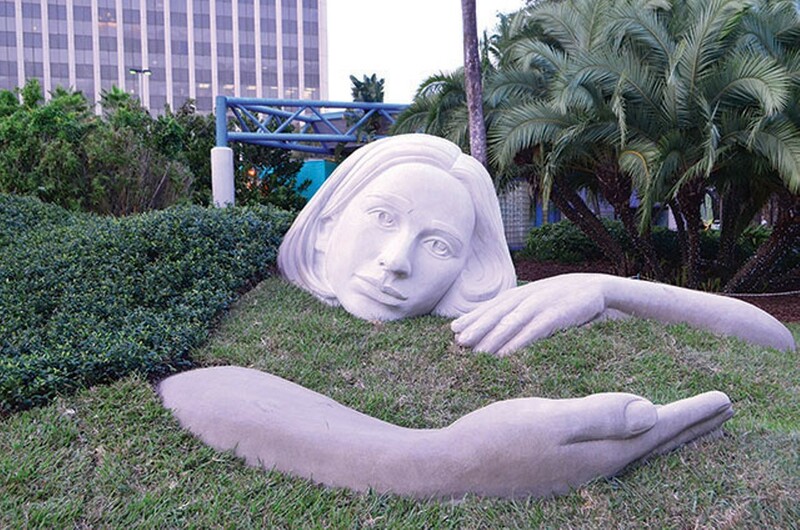 Sculpted of Indiana limestone, she might be symbolic of our city's emerging artistic spirit – or she's a reference to White's similar piece in Schaumburg, Ill. No doubt she'll get a lot of frat boys foraging through the ivy to see if she's really all there. Anyway, it's a great way to change the scale of the city. 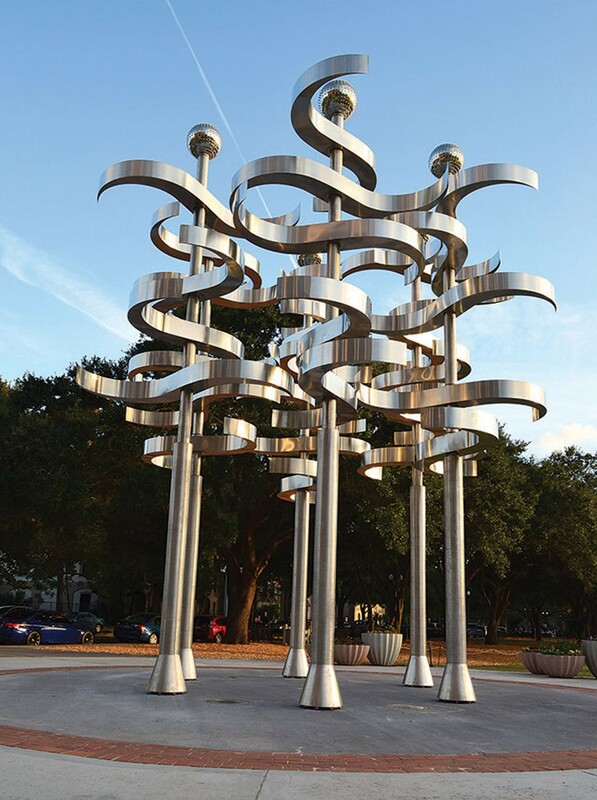 Shining in the sun, Gschwend's kinetic wind and light sculptures have twirled at Olympic venues and in various cities in Europe, and now Orlando gets one as well. They look like our native pines, but no metal pine cones will be coming off these things. They will be fun to watch in a hurricane. 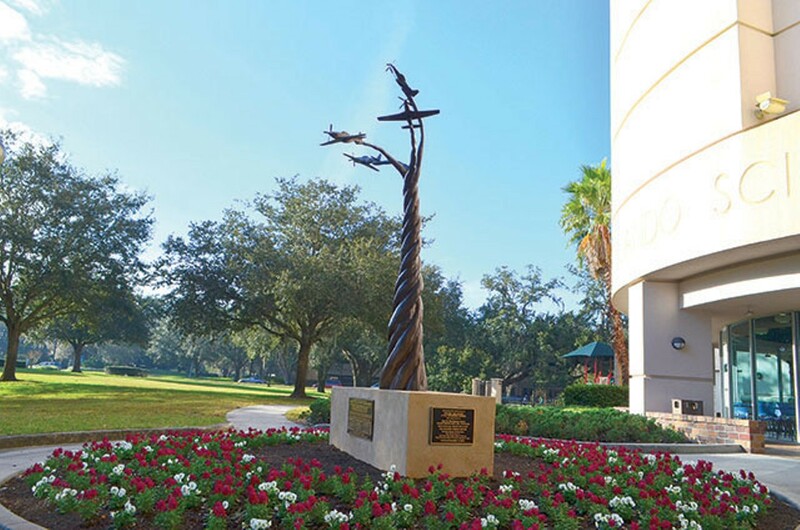 Carpenter's 20-plus-year-old piece badly needed restoration, and the Orlando Chapter of the Commercial Real Estate Women made it happen. Sparkling and radiant, its lights really work now. (Buddy Dyer flipped the switch recently to make sure.) The restoration was performed by a cadre of local engineers, architects and craftsmen, who should be applauded for their effort. It's about time the African-American pilots of World War II get recognition on par with the rest; this bronze monument honors their memory and remarkable service record. It's always cool to see these planes, and especially to see them here, knowing the pilots faced more than just hostile enemies in the sky. Urban Art Museum installation at Tako Cheena, 932 N. Mills Ave.
Local artists Cruz and Cornetet created this joyously colored metal sunflower, to be shown on the wall of Mills 50 restaurant Tako Cheena. It's part of the Urban Art Museum, which is "not a building. 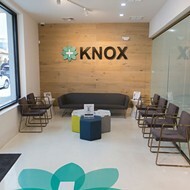 It is an urban network of commissioned art pieces that will be installed in select areas to restore blighted structures, reduce pollution, deviant activity, increase the attractiveness of the district and to promote organized urban art," according to founders Cornetet and Wes Featherston.